Happy Sunday everyone! Hope you all have had a fabulous weekend! I haven't done much other than lounge around the house and watch Netflix. Oh, I did bake a cake and paint my nails. Shocker, right? I live a rather boring life. Also, can you believe it's already the first day of March? Where did the first two months of the year go?? Oh well, the sooner we get through these cold months, the sooner the warmer weather comes. Bring on Spring! 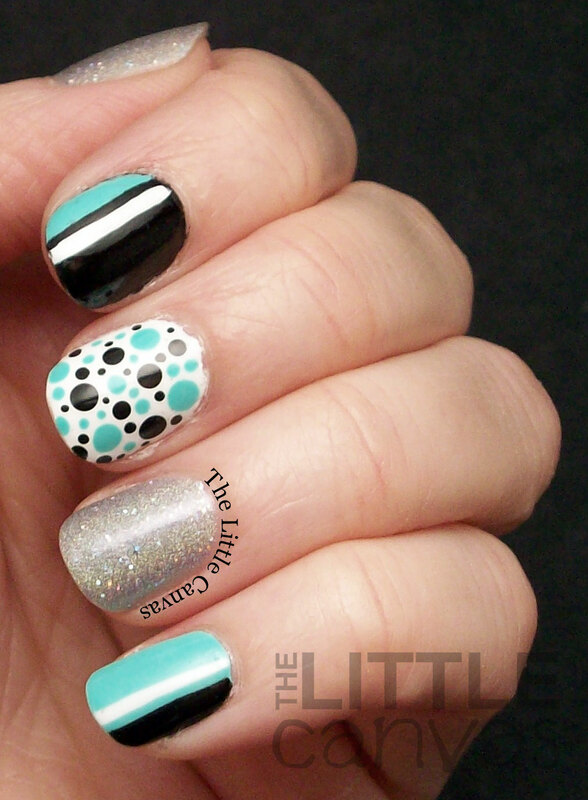 Today I'm sharing a not so boring manicure which was inspired by Young, Wild, and Polished. I saw the manicure a few months ago and wanted to try it and finally got around to doing so. Nothing is better than doing a little mish mosh manicure with some neon to brighten your day! I love this color combo. The bright mint, the holo silver gorgeousness. It's just all perfect! I still am kicking myself that I never grabbed a back up bottle of Mirrorball. If someone from Orly is reading this, please, oh please make this polish part of your core collection! I cannot find a single thing wrong with it and need a zillion bottles! I feel my work was messier than normal on this manicure. Maybe the winter is making me sloppy. Also, I'm pretty sure that this weather is messing with my polishes. Everything is kind of goopy! Even my new polishes! It makes no sense to me...but oh well. What do you think? Fan of this manicure? Do you think Orly should make Mirrorball part of their core collection too? Well I am of to lounge around some more!